SANSON -Belgica in Provincias Quatuor et Populos Viginti aut circiter. . .
SANSON, N - Belgica in Provincias Quatuor et Populos Viginti aut circiter. . . 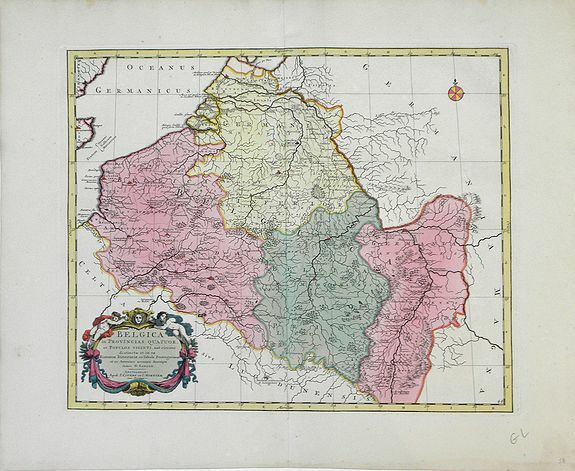 Title : Belgica in Provincias Quatuor et Populos Viginti aut circiter. . ..
Map maker : SANSON, N .
Size : 20.7 x 24.7 inches. / 52.7 x 62.8 cm. Description :This map, published by Covens and Mortier, covers present day Belgium, once known as Belgica, and the surrounding provinces. In the 1st century AD, the provinces of Gaul were restructured into four separate regions: northern Gallia Belgica was renamed Germania Inferior (modern day Belgium), the eastern part was renamed Germania Superior (present day West Germany and Eastern France), and Belgica Secunda was formed to the west. Each of these regions is delineated through color and shows the major routes between cities. The cartouche is colorful and decorated with figures. For much of the 17th century, the Dutch led the world in cartography with their highly decorative maps. Toward the middle of the 17th century the French began to mark their presence in the world of map publishing. It is generally accepted that the great age of French cartography originated with the work of Nicholas Sanson, who is regarded as "the founder of the more precise and scientific French school of cartography and geography." Condition : Repaired less then a quarter inch tear on right edge. Light wrinkling of paper around the edges, evidence of previous repair to the central crease. Otherwise excellent condition with full paper margins. The letters "GL" and the number 38 have been hand-written in pencil to the bottom right corner.